Aydie is located some 40 km north-east of Pau and 15 km east of Garlin. 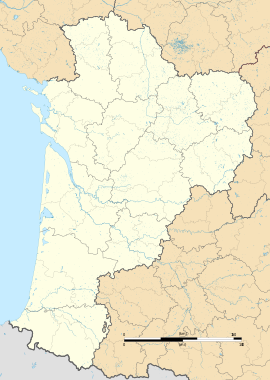 The northern border of the commune is the departmental border between Pyrénées-Atlantiques and Gers and the eastern border is the border with Hautes-Pyrénées. Access to the commune is by the D292 road from Aubous to Arrosès which passes south through the west of the commune. The D317 branches off the D205 west of the commune and goes east through the commune to the village then continues east, changing to the D548 at the border, to join the D48. The commune is mainly farmland with scattered forests in the west. The Sager river forms the eastern border of the commune as it flows north to join the Adour at Saint-Mont. Several streams rise in the west of the commune and flow east to join the Sager including the Boutigué which forms part of the northern border of the commune. The commune name in béarnais is Aidia. Michel Grosclaude said that the name probably has a common root with Aydius but the origin and meaning of the name remains obscure. Paul Raymond noted on page 18 of his 1863 dictionary that in 1395 Aydie had 25 fires and Poey (Page 136) had 6 fires with both of them under the bailiwick of Lembeye. The commune is part of the appellation d'origine contrôlée (AOC) zones of Madiran (Red Madiran wine), Pacherenc-du-vic-bilh (White Madiran wine), and Béarn. Joseph Peyré, born in 1892 at Aydie and died in 1968 at Cannes, was a French writer. He won the Prix Goncourt in 1935 for his book Sang et Lumières (Blood and Lights). He evoked his native village under the pseudonym of Saint-Jean-des-Vignes. Wikimedia Commons has media related to Aydie.